Type 2 Diabetes or one of 86 million Americans diagnosed as Pre-Diabetic then the HYD® program is for YOU! Type 2 Diabetes is a growing problem that is not going away! 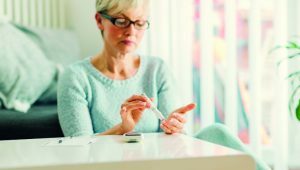 Sedentary lifestyle, lack of regular exercise, diet loaded with convenient fast food, sugary drinks and a new generation of couch potatoes who spend increasingly more time on the smartphone means that now more than ever, Type 2 Diabetes is on the rise. Dr. J. Murray Hockings, D.C., D. P Sc., a member of The American Diabetes Association (ADA). An internationally acclaimed author and spokesman; Dr. Hockings has been helping thousands of patients reverse their Type 2 Diabetes, lose weight via proven natural methods, drop their blood sugar readings, enjoy an improved quality of life, and get people off harmful medications – which only serve to manage symptoms and cannot reverse them. Medical Schools train student doctors how to manage Type 2 Diabetes – but not how it can be reversed! They prescribe often costly medications aimed at lowering one’s A1C. As the symptoms worsen they refer patients to a Specialist who may prescribe additional or different medications – increasing the dosage and/or varying the drugs over time. Drugs prescribed to treat Type 2 Diabetes just manage the symptoms by lowering A1C and blood sugar, but can do little to prevent this horrific disease from progressing and in many cases leading to neuropathy, loss of eyesight, amputation of limbs or to kidney failure; which necessitates harmful dialysis for the rest of their life. Pharmaceutical manufacturers must by law, disclose the potential dangerous side effects of all medications prescribed to treat Type 2 Diabetes. Their drug’s long-term effect is potentially AS dangerous to the patient as is the disease itself! Diabetes drugs are also very expensive for the patient, earning pharmaceutical manufacturers hundreds of billions of dollars annually! Noticeable improvement in as little as one week! HYD® patients can reverse their Type 2 Diabetes safely, lose excess weight, need far less or no medications, regain energy and enjoy improved quality and vitality in their daily life. Dr. Kenneth Power, M.D. a family doctor in Maumee, Ohio, with 18 years of experience, has recommended the Help Your Diabetes® program to his patients: “The success I’ve had with the program has been overwhelming. I’ve had multiple patients come through now and each tend to have a different success rate, but overall, it’s been phenomenal. Patients see results right away. Appointments Necessary, evenings and weekends available upon request. Previous Are you Chronically Anxious?